More news from the Justice Department on corporations cooperating with criminal investigations: from now on, prosecutors will only insist that companies identify individuals “substantially” involved with the misconduct in question, rather than everyone involved. So says deputy attorney general Rod Rosenstein, who announced the new policy on Thursday at the annual FCPA Conference happening in Washington. He framed the change as reverting to historical norms, where prosecutors had more discretion to award cooperation credit to companies even if those companies didn’t hit every criteria for cooperation credit. “Our revised policy also makes clear that any company seeking cooperation credit in criminal cases must identify every individual who was substantially involved in or responsible for the criminal conduct… Our policies need to work in the real world of limited investigative resources,” Rosenstein said. The idea that a company that engaged in a pattern of wrongdoing should always be required to admit the civil liability of every individual employee as well as the company is attractive in theory, but it proved to be inefficient and pointless in practice. Our civil litigators simply cannot take the time to pursue civil cases against every individual employee who may be liable for misconduct, and we cannot afford to delay corporate resolutions because a bureaucratic rule suggests that companies need to continue investigating until they identify all involved employees and reach an agreement with the government about their roles. A cynical interpretation would be this: folks, holding corporations and their employees accountable for wrongdoing is really hard, and we don’t have enough money to pursue everyone, so we’re not going to do it. Just do your best to tell us about the truly bad apples. The truth, of course, lies somewhere between those two points. The Justice Department does have limited resources; corporations scrounging up every bit of information on every participant in a wrongdoing scheme does waste resources, since many of those participants won’t be prosecuted. To that extent, Rosenstein is correct. 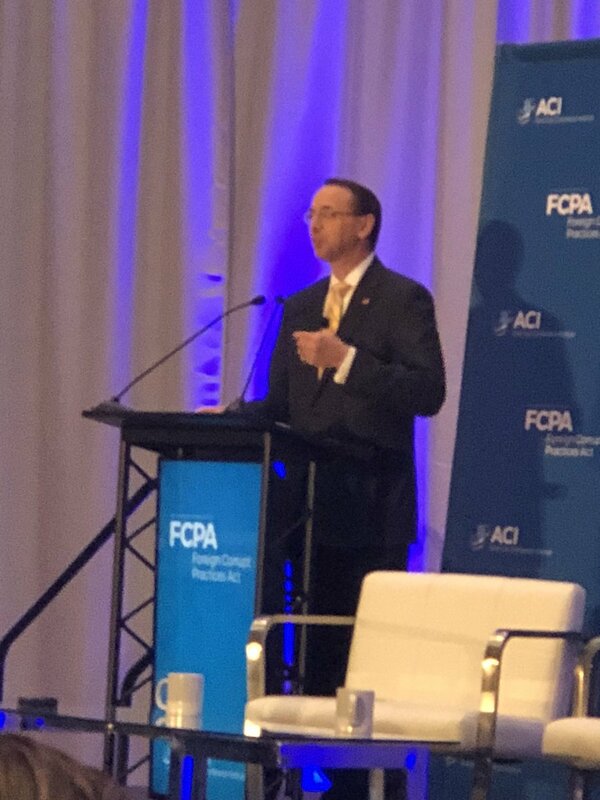 Rosenstein, speaking Thursday at the FCPA Conference. Compliance officers can take Rosenstein at his word, because Rosenstein has so far proven himself to be an honorable, thoughtful prosecutor. Still, Rosenstein is introducing more discretion into enforcement of corporate misconduct cases — so it’s valid to ask how this policy might be applied, now and in the future, by others who are not as honorable as Rosenstein. For all our talk about a more nuanced approach to sanctions against corporate misconduct, we can never ignore the prime fact: the head of the Trump Administration is Donald Trump, and people don’t trust him to be ethical. Nor do they trust many of his lieutenants to be ethical. Rosenstein is a rare exception, but his tenure will end eventually. Meanwhile, we also still have a phalanx of other federal prosecutors, civil agencies such as the Securities and Exchange Commission, and plaintiff lawyers who will all try to contort standards of corporate enforcement to their own ends. How will they stretch this policy? We shall see. Rosenstein’s speech is an interesting contrast to another one given just one day earlier, by deputy assistant attorney general John Cronan. As we already noted, Cronan stressed the importance of companies self-reporting misconduct to the Justice Department, and of having a strong compliance program in place to prevent future offenses. That’s always one question compliance officers want to ask about any Justice Department enforcement policy: Will [insert new policy here] tilt the thinking of senior executives and corporate defense lawyers away from self-reporting, in favor of hoping the Justice Department will never discover the misconduct? If so, that undermines your quest for a stronger ethical culture. Second question: Will [insert new policy here] lead the CFO and other senior executives to believe they can skimp on investments in compliance programs? Throughout his tenure at the Justice Department, Rosenstein has worked mightily to strike a less threatening tone with Corporate America, without leading boardrooms, general counsels, and CEOs to believe they can keep quiet about misconduct. In theory, it’s a reasonable approach: more carrot rewarding self-disclosure and strong compliance, less stick of monetary penalties that take money out of shareholders’ pockets.